According to a recent message The Waldo has disappeared with the parish car (along with some other parish property). I am awaiting more details about the description of the car and the license plate. If you have any information, please comment or send it to junglewatch.info@gmail.com. It's a black Hyundai Accent if I'm not mistaken. If Waldo left Guam unannounced, there's the possibility he parked this black Hyundai accent at the airport. Wouldn't the vehicle also belong to the archdiocese and therefore the chancery have a copy of registration of ownership/registration with its license plate...just saying. Esta. Waldo left without informing his superior and without getting permission. He is reported to be in Chile. We pray he stays there. Waldo should immediately contact Archbishop Byrnes informing him of where he is. All priests including Wadeson should inform Archbishop Byrnes where they are. Waldo is incardinated into Archdiocese of Agana. Archbishop Byrnes is his bishop and Archbishop should know where all priests under his Diocese live. He can live in Chile no problem. But with permission of Archbishop Michael. otherwise we create wondering priests. Not to be encouraged for the good of the priest above all. Well, yes, wondering. But I think you mean "wandering." If I remember, the Canon Law term for a renegade like "Master Juicer" is VAGUS. 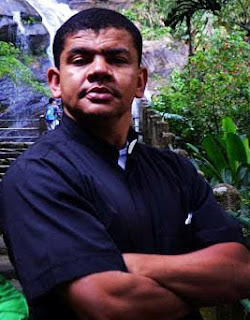 Juicer has been a rogue element even as a seminarian, then as a priest, because he was one of Apuron's two privileged bodyguards, the other one being Presbyter Harold Prieto-Colorado. His whereabouts right now is a big question mark but at least he was not as crass as Juicer. Juicer, by the way, did not have an college degree when he arrived on Guam but somehow the likes of David Cadaver Quitugua finagled to get him ordained. Who paid for his Ejivaldo's airline ticket? Independent, wandering, or vagus priests are indeed forbidden by the 1983 Code of Canon Law or Codex Iuris Canonici (CIC). “[U]nattached or transient clerics are not allowed at all.” CIC, can. 265 (HTML link infra). Archbishop Byrnes will also need to address the refusal of Fr. Cristobal to consent to his transfer from Barrigada to Umatac, as well as that of any other recalcitrant priests. See CIC, Cann. 1748-1752, The Manner of Proceeding in the Transfer of Pastors, available at http://www.vatican.va/archive/ENG1104/__P70.HTM . Perhaps his recent trip to Japan is a prelude to an attempt to be excardinated from the Archdiocese of Agaña and incardinated in a Japanese diocese, perhaps in service to the NCW Cult. See CIC, Cann. 265-272, The Enrollment, or Incardination, of Clerics, available at http://www.vatican.va/archive/ENG1104/__PX.HTM . It's against canon law to reassign priest without notifying them...ask Adrian and Evi. However, it's okay to run away to another country without notifying your boss....ask Adrian and Evi....they know Canon Law. Why think that Adrianna went to Japan? With all his money, he might have traveled to Rome or wherever ApuRun is to ask about the Canon Law? Poor Adrianna - Still thinking that Barrigada Loves Him! NOT! Reliable sources tell me that he stashed the parish(Chalan Pago) car at the RMS. Parishioners are pissed. According to my Neo friend, when he heard Waldo's sharing on several occasions, including his second scrutiny, he was a loose cannon, arrogant, impertinent, and petulant. Fr. Pius, his Catechist, castigated him. Waldo was not ready to be a priest. Important for all priests to clarify what is personal and what is parish owned. There must be clear distinction of assets. if the parish purchaed this car it belongs to the parish. once the priest leaves a particular parish the car remains in the parish. I hope this matter does not involve theft of parish owned assets. It was parish owned and is insured by the archdiocese (meaning us). A police report needs to be filed to get the vehicle back to the parish and arrest pending Waldo's return. This would also include other assests that were taken! what assets were taken from his parish? How about checking At Pago Bay?.. :-). Time to put the squeeze! Any parishioner with knowledge of what happened can call the police. I can understand that the pastor wants to keep this out of the press, but now is the time for the people of Chalan Pago to stand up. The parish of Chalan Pago is infested by NEOs. NEO member Wayne Santos in Thanksgiving Mass when asked by Pastor Carl what he is thankful for he made it clear that they have a mission for the parish. OMG help us. Yup, Waldo will eventually turn up where he was assigned: DOC. This time, it will be full immersion into the DOC culture with his new convict buddies. he'll learn to turn the other cheek!!!!! Why not just have stipends stopped for ALL not serving in the Archdiocese. On another note, I wouldn't put it pass Princess Di to say that she has news of Waldo. Probably state that he is the key witness for Tony's canonical trial. correct. Archbishop Byrnes First order of the day is to know who priests are? Who is he paying who is not working on Guam. It is such a mess you may find you have priests you dont even know you are paying. How much are you paying Apuron wadeson camacho others. How much money of the prople are you throwing down the drain? A juicer or just an absconder? And take a moment to ponder. Cant believe the Parishoners of Chalan Pago are letting Udu-valdo get away with stealing the parish vehicle and is now AWOL, or MIA? Could it be that office staff at the parish are NEO mates, and are turning a blind eye to Udu's actions? Even if the title of the vehicle is in the name of the Archdiocese of Agana, does not the parish pay for that vehicle and shouldn't that vehicle remain in the parish for the priest assigned to that parish to use? Someone should report that vehicle stolen..
Heard that Fr. Carl the now Parish Priest formed an "Interim Parish council" replacing the previous Parish Council predominantly NEO members that somehow weren't that active. With this Interim Parish Council one or two are NEOs. Very hard to hide today. question is. Why would he need to hide? I was told by a friend that Adian arrived on Nov. 22 coming from a flight from Japan to Guam. I know because a friend was on the same flight as he was. what was Adrian doing in Japan? Adrian must be taking up sumo wrestling as his next career choice. Let's hope Archbishop Byrnes sends Adrian away permanently-from Guam and from the priesthood. Due to my online investigative skills, just LOOK UP, isn't that where every MONKEY should be...Up on a tree! I hope the Brown Tree Snake bites and swallows him whole! Wouldn't that be cruelty to the brown tree snake to feed him Udi-valdo? A presbyter, thief or a flunky? Any updates? Did they release any info about the license plate or if it was found? I'm certainly not defending any wrongdoing on his part, but is the missing car his privately owned vehicle? If so, no theft occurred. Literally all working diocesan priests own cars. Some retired ones do too. Unlike religious Orders, they don't take a vow of Poverty. Some of them are millionaires due to family money and/or investments. i hope the new pastor at chalan pago, fr karl, has another car to use. without one, he wouldn't be able to make visits and administer the sacraments in parishioners' homes when called for--i'm thinking, for example, of the anointing of the sick. didn't edivaldo think about that? so much for caring for your flock. Kiko's don't believe in sacraments. 5:54 AM, not true. Parish provides the vehicles used by diocesan priests under the aegis of the Archdiocese, and under one company insurance plan paid for by the parish. In fact, using privately-owned vehicles are frowned upon. At present, only one priest is using his private car. It is different with deacons who are not specifically assigned to a parish. They drive their private vehicles along with their families. that's a great point, tim. 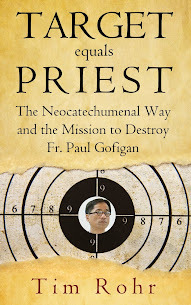 it underscores again the gravest problem posed by rms-trained presbyters and kiko priests. Working diocesan priest-friends in the US buy their own cars. A priest-friend in a major archdiocese was extremely upset when told that his old car wasn't worth the $1,100 engine repair it needed. He had to buy a new car with his own money. All priests might get from their diocese here is a blanket car insurance policy with lower rates. Permanent deacons are usually married with families. They always buy their own cars. Guam provides cars for its priests. Regardless of what is done in the US, Guam provides. Few priests have their own, but if they do it is by personal choice. End of discussion! Udu-valdo had a parish vehicle provided, he failed to leave it with the parish when he was reassigned, therefore he should be charge with Grand Theft Auto. Odds are the car is at RMS being used/abused by seminarians. They have a long standing record of going through vehicles like nobody's business. Apurun would buy them replacements, so the idea of maintenance was foreign to them. Parish cars are in the name of the Archdiocese of Agana because the parish is not a corporate entity, only the Archdiocese. But parishes use their funds to purchase priests cars and the Archdiocese does not take vehicles away from the parish. The parish also pays for insurance, maintenance and gas. Finally, deacons don't get parish vehicles, even if assigned to the parish. They use their own vehicles. Folks-if you don't know the facts stop speculating. Please. We have important business to deal with, and your conjecture just makes it more difficult. Stick to the important issues. In the US, diocesan priests and permanent diocesan deacons own their own cars. Cars driven by religious Order priests belong to the Province and are assigned to communities within it. The car In question belonged to the parish. No need to go beyond that fact. Do we know the model year and license plate number of the black Hyundai Accent yet? If the archdiocese or parish is paying the liability insurance, this information should be available for dissemination to parishioners. Yes, but apparently chancery wants to solve this "internally." It's a matter of public scandal once again; the chancery owes the faithful whose offerings bought the car an accounting of its whereabouts. Otherwise, why continue to donate to a local church that lacks any semblance of transparency even after the messes that have been uncovered? Accountability for EVERYTHING needs to be on steroids at this point. This isn't your undercover hush-up from the Middle Ages and the Church needs to put itself back in integrity because the world is watching, reading, listening, etc. Priests aren't supposed to be rogues! How long O Lord, how long? 1. Make beeline to the airport in said black car. Ditches car somewhere and makes it to the airport. First fist pump.... made it to the airport. 2. Boards plane to destination (unknown at the moment) without any incident or being recognised. Second fist pump.... made it onto the plane. 3. Arrives at destination airport, without any incident or being recognised. Third fist pump.... made it to the destination airport. 4. At destination is picked up by NCW cult member and taken to a NCW house. Fourth fist pump.... made it to the NCW cult refuge. The latest is that he is in Argentina. AWOL. Edivaldo! Who bought your ticket? Miss you! Not. Tell him to go back to the jungles of Brazil and open up an Orange Juice Pumping Business. Applying for Media Communication directors position up at the Chancery. Way to go Edivaldo. You have experience. Yes. Uduvaldo definately seen at Chancery earlier this week. Fr Miguel Angel accompanied into the offices. Only fly on wall knows what the discussion was, but with Adrian gone, fly on the wall has been pretty quiet. At procession today there was no parish sign for Umatac. The Church opted to still combine Merizo/Umatac. I hope that means monkey boy Fr Uduvaldo is out. Ha, Miguel just dumb enough to follow mandate of Udivaldo to Chancery. Gentle Miguel to prop him up, make him look better. Oh, Geez. This story stinks. Where will he be seen next? Antarctica? If the alleged thefts and fugitive were properly reported to police, he could have been caught at any of the airports where he was reportedly seen. Ticket purchases are easily tracked and there's at least one refueling stop between Guam and South America. That's a long, expensive trip. Good chance he never left Guam. AnonymousDecember 8, 2016 at 2:54 AM says: "...South America. That's a long, expensive trip. Good chance he never left Guam." Obviously, anon and many others are not familiar with the globe-trotting tendencies of our NCW presbyters. To think that Uduvaldo must be on Guam solely because a tkt to South America is expensive is a far fetched assumption when reality says that travel funds are nearly unlimited for kiko presbyters. My granddaughter and I were at the airport in Hawaii coming back home from medical treatments. She was so excited when she saw to priests at check in. They were not regular travelers, Fr Harold and Fr Vincenzo. They were in the Premium line. And instead of going to the gate to wait, they went straight up to the United Club. A friend of mine was in the Club and said they were at the bar the whole time, in their white collar and black shirt/pants, talking with the bartender like they were best friends. She was disgusted with what she saw. That is the "tough life" of a kiko-presbyter. They get no sympathy from me. Oh, yes, pampered. They are! Janet B, look at a map. Guam to Hawaii is only around 3,900 miles. Maybe a 6 to 7-hour flight. Apuron and Wadeson vacationed there. Guam to Argentina is nearly 10,000 miles. If he went to Argentina, there was plenty of time for the police to locate his flight and arrest him when he landed. Either the incident wasn't reported to police, or the parish knows where he's hiding on Guam and won't turn him in. Maybe he's in Hawaii. Perverts Apuron and Wadeson used to vacation there together with unidentified "friends". Their going from tropical beaches in Guam to distant, almost identical, ones 4,000 miles away doesn't make sense (unless their Hawaii contacts were part of the evil NCW ring). With the arrival of Byrnes, did all the Neo priest disappear? Waldo/Adrian has been MIA...When Byrnes goes back later this month to Detroit will the Waldo and friends come out of hiding and start trouble with Father Jeff who I'm guessing will be in charge when Byrnes goes back to Detroit finish what he needs to finish there. Adrian has been concelebrating in Barrigada. The fruit of the NCW Cult. Byrnes is returning to Guam full-time in mid-January. 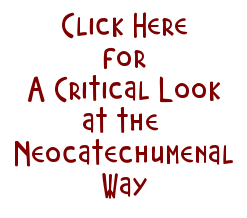 The Neocats won't have enough time to make any significant trouble. He'll be advised of any skulduggery during his brief absence. He and his attorneys can deal with it from Michigan. Does the RMS “Seminary” have a gated, covered, or underground parking area? It doesn't need all of that if there's an armed security guard at the entrance. Add a Rottweiler to keep him company.